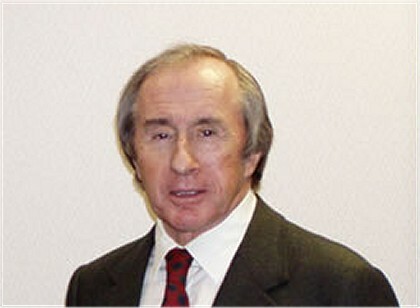 Autosport reports that Max Mosley has refused to back down from his ridiculing of Sir Jackie Stewart recently. At a media lunch, Mosley described Stewart as a "certified idiot" who dresses oddly. He also said that Sir Jackie does not know what is going on because he never stops talking and that "he goes round dressed up as a 1930s music hall man." Stewart is reported to be considering legal action against Max for his remarks which, as pointed out by Damon Hill in a letter to Autosport magazine, were particularly insulting since Sir Jackie is well know to be a dyslexic. But Max apparently stands by what he says, furious at Stewart's criticisms of the WMSC's investigation into and punishment of McLaren's alleged use of Ferrari documents earlier this year. For some time now, Max's actions and words have struck me as personally motivated and ill considered at best. The abuse he has hurled at Stewart merely for criticizing the WMSC (not Mosley himself) is merely the latest in a series of remarks that appear to stem from very personal feelings indeed. I begin to wonder if power has gone to the man's head and what we are witnessing is a complete breakdown in his connection with reality. Consider the differences between what the two men said. Stewart said that the WMSC's sanctions "probably wouldn’t have held up in a normal civil court." Nothing controversial in that, in my opinion - to anyone who knows something of the law, it is pretty obvious. Sir Jackie went on to say, "I thought that it was handled very poorly, and I think (the fine) was (handed down) because it would get an immense amount of attention globally. It seems some of the most powerful people (in F1) are more aligned to Ferrari. There are more Ferrari representatives on the World Council than anybody else." Note that Stewart says it is his opinion; he is not claiming omniscience or anthing like it, although much of what he says is verifiable fact. There either are or are not that many Ferrari representatives on the World Council. Instead of answering Sir Jackie with reason and facts, Max proceeds to insult him with a tirade of ridicule, presumably assuming that this will discredit what Stewart has said. It does not appear to strike him (hence his refusal to retract the remarks) that insult is not a suitable defence against criticism and is certainly not the sort of thing we should expect from a president of the FIA. If Max feels that Sir Jackie was wrong in anything that he said, it is not unreasonable to expect that he should prove it. Of course, we understand why Max has reacted in this way. He is angry that the WMSC, a committee that he sees as an extension of himself (read the transcript to see how much participation there was by other delegates in the McLaren case proceedings) and has allowed emotion to fuel his statements. The worrying thing is that he stands by them. A reasonable man calms down after the release of emotion and can see that he has acted injudiciously; on most occasions, he will apologize for such hasty acts. Yet Max is sticking to what amounts to a string of insults and cannot see that this compounds his problem. This surely is the behavior of a man becoming unbalanced with pride and power. As far as I can see, it is very likely that Sir Jackie would win quite easily in any suit brought against Max for his statements and that would be a very good thing. For far too long Mosley has been allowed to rule F1 without fear of contradiction and it is time he was revealed as a long way from perfect. I must admit I thought what Max said a bit strange! He hasn't actually named anyone though has he, so it may be hard to prove it actually was Stewart he meant, even though everyone knows it is. Unless Jackie stands up in court and admits to being the only halfwit in F1 then it could be assumed by the court that Mosley could have been referring to any one of a number of people! I had assumed Max said these things in the heat of the moment or on a bad day and would have simply retracted them by now, but it would appear that he has no intentions of doing so. Perhaps a day in court for him would do him (and us all) a lot of good. That would be a good defence, Craig, that Max didn't mean Sir Jackie when he said those those things - except that, by refusing to retract them after Sir Jackie's objection, he has confirmed that is exactly whom he meant! That would have been the time to say, "Oh no, Jackie, I didn't mean you!" Either way, regardless of what a 'civil trial' would show, he has lost face in everyones eyes. Whomever is currently supporting Max in his position should be second guessing themselves. He has been acting more like a Dictator with defiant Generals than the President he is supposed to be. Like Clive said on F1 Fanatic, Wurz is available. I suggested Wurz as replacement for Max some time ago and just as a joke but, the more I think about it, the more I realize he is the ideal candidate, Dan. Everyone loves the guy and would have no objection to his taking over and we could be quite sure that he would be completely open and fair in all his decisions. Good grief, he might even listen to what the fans have to say! It would be nice to see someone running the sport who has actually driven in it. Aside from making money, the most important part of the sport is the racing. If anyones opinion should count it is a former race driver, someone who has been around for many of the recent rule changes. He would have Sir Williams backing for sure. I think that I don't have enough personal attachment to the issue to be as offended as I should, but I'd like to think that a certain amount of respect is due considering we say "Sir Jackie Stewart" but we only say "Max Mosley". Although I assume that any legally plausible punishment would only be symbolic, Max should not make fun of the people that effectively created his power as if he and they are children. To hear Bernie Ecclestone talk on television, it is likely that Max thought he was talking about Bernie, but I digress. Alex Wurz should replace Bernie Ecclestone. I think Mario Andretti should replace Max Mosley. Not a bad idea at all, Chunter. Isn't it funny that half a minute's thought can give us any number of candidates for FIA president who'd make a better job of it than Max? However it is done, Max needs to go. He is the one single factor that has done more damage to the sport than anything else, via embarassing episodes like this one or ill-advised decision making. Said Max: "he goes round dressed up as a 1930s music hall man." Am I the only one who got his halloween idea after reading this? The thought hadn't occurred to me, Eric. Scary! When Sir Jackie made those remarks he only stated what was on alot of peoples minds. There is no part of what he said that I disagree with. It is obvious that the size of the fine was only to attrack world press. The attraction was not very positive. It made the sport appear for the rich and spoiled only. I think that Jackie would welcome the chance to have Max's job though that is not why he spoke. I agree that Wurz would be a great choice to work with Jackie until he is ready to take over. Max's position should be filled by an experience driver or owner. Max will not give up his power without a fight. I think that Jackie needs to smack him with a lawsuit to bring him back down to earth. Exactly my thoughts too, John. It is amazing how many F1 fans are in agreement on this - and most of those involved in F1 too, I suspect. isn't a president, 'elected by the people'? (or almost half the majority in Bush's case). Does Max not have a term in office that he would have to be re-elected for? Unlimited tenure, profit sharing?! Race in China?! sounds like Communism to me! The position of FIA president is indeed for a limited term (although it may seem never-ending to us) but I forget exactly how long the period is. Alianora knows these things and has told me any number of times but it's the kind of information that does not seem to take root in my mind. All I know for certain is that Max has a considerable amount of time yet to go before any re-election takes place and, even then, the voters are the representatives of the various countries' motor sport bodies and they tend to be a little under his thrall. My hope is that he has overstepped the mark this time and there may be something rather more abrupt than an election that brings his tenure to an end. MadMax has approximately three years remaining in this term. I will start my campaign for the FIA Presidency on January 1st, 2008. About time they had an American in the job, Number 38! Max Mosely comes up for re-election in October 2009. And since the people who do the voting are the eight members of the current WMSC FIA cabinet (all of whom Max hand-picked some time ago), it would take a lot to unseat Max. This is why revolution is necessary. And it will come from the manufacturer teams. Hi everyone. The trick is to make sure you don't die waiting for prosperity to come. I am from Ireland and , too, and now am writing in English, please tell me right I wrote the following sentence: "Com offers airline tickets to all major international destination." With best wishes :), Antonie.